Another September 11th and as I get up and begin my early morning writing routine, I can’t help but think of that day back in 2001. It started like any other day. I got up at 2:20am, showered, ate something and dashed out the door and into another Murdock, Hunter & Alice Show on KLSY. We tried to plot out breaks and at 5:50am, we were going to play a pre-recorded interview I had put together with an author who wrote a book on some of the more bizarre phone calls that had come into 9-1-1 over the years. Thus, he chose this date for his big media push. You know, 9-11, 9-1-1…. But in that slowly waking up half hour of the show, we caught on the TV monitor in the studio that a plane had crashed into a building in New York City. That was too bad. Probably some small prop plane with a hot-shot pilot and a couple of tourists who dared to get too close to a building. As we began playing the second song of that 2-song sweep before the 5:50am break, we heard reports it was a commercial jetliner. Over the next couple of minutes, we anguished over whether we should scrap what we had planned or take on this as a morning topic. We wisely opted for the latter and that author’s interview never aired. In the days following the attack and all the insanity that took place, it just seemed wrong to make light in any way of that day and the date. By the end of the year, I had stumbled across an interesting angle on 9-11 and to this day, I don’t many people know about Angel Juarbe Jr. and how that day marked the end of his life. I’m going to insert the piece I included in my column for the Bothell/Kenmore Reporter as we wrapped up 2001 and pass the story along to you that way. 2001 was a year of reality. Reality shows filled our television sets and it seemed like we couldn’t wait for the next episode of “Temptation Island”, “Boot Camp” or “Survivor”. That is, until we all had a major jolt of reality on September 11th. At that point, a group of terrorists brought an incredibly ugly real into our lives and our world changed forever. 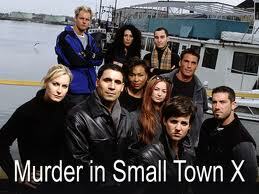 One of those reality shows I enjoyed was a FOX murder-mystery series called “Murder in Small Town X”. A group of people basically played a whodunit in an Atlantic seaboard town, each week ruling out suspects and eliminating players. When all was said and done, a guy named Angel Juarbe won and walked away with the $250,000 first prize. He was a likeable, honest guy. Family and friends cheered as they watched him emerge the victor, including his co-workers at a fire department in New York City. Seven days later, reality television clashed with the terrible reality of September 11th. Angel and the 12th ladder company of the NY Fire Department were among the firefighters that responded to the September 11th terrorist attacks and quickly found themselves inside the Marriott Hotel next to the World Trade Center’s north tower. He was helping people evacuate when it collapsed. One week, he lived an American dream, the following week he died an American hero. Though I met him through a cheesy TV show, Angel Juarbe gave me a face to help remind me to make every day of life really count. That remains true of this day and every day. But it’s on September 11th of each year that we can’t help but reflect back on that unthinkable series of events we all lived through together.